Featuring a seasonal continental breakfast Sage Inn and Lounge is located in Provincetown. Free Wi-Fi access is available is all rooms. Beach towels and loungers (surcharge) are available to guests. 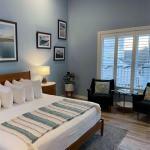 Rooms here will provide you with a TV featuring cable channels air conditioning and an i-Pod dock. Featuring a hairdryer private bathrooms also come with towels and linen. At Sage Inn and Lounge Provincetown the seasonal lounge offers cocktails and light fare. The inn is 200 m from Pilgrim Monument 900 m from Province Lands Visitor Center and 2.8 km from Beech Forest. Logan Airport is 77 km away. The property offers parking at an extra cost.